Heterotopic ossification is the word used to describe bone that forms in a location where it should not exist. Heterotopic ossification generally means that bone forms within soft tissues, including muscle, ligaments, or other tissues. Often abbreviated "H.O.," heterotopic ossification can occur just about anywhere in the body. Heterotopic bone often forms after surgery, injury, or sometimes for unknown reasons. The most common symptom of heterotopic ossification is stiffness of a joint. Most people who develop heterotopic ossification cannot feel the abnormal bone, but notice the bone growth getting in the way of normal movements. Heterotopic bone often forms around the hip or elbow joints, making bending of these joints difficult. Other symptoms may include a mass that can be felt, deformity of the area, or pain. Heterotopic ossification occurs when the body gets signals mixed up, and bone cells begin to create new bone outside of the normal skeleton. The body constantly makes new bone to replace bone within the skeleton. When fractures occur in the bone, new bone is formed to heal the damaged bone. In people with heterotopic bone formation, a similar process takes place, but often for an unknown reason. 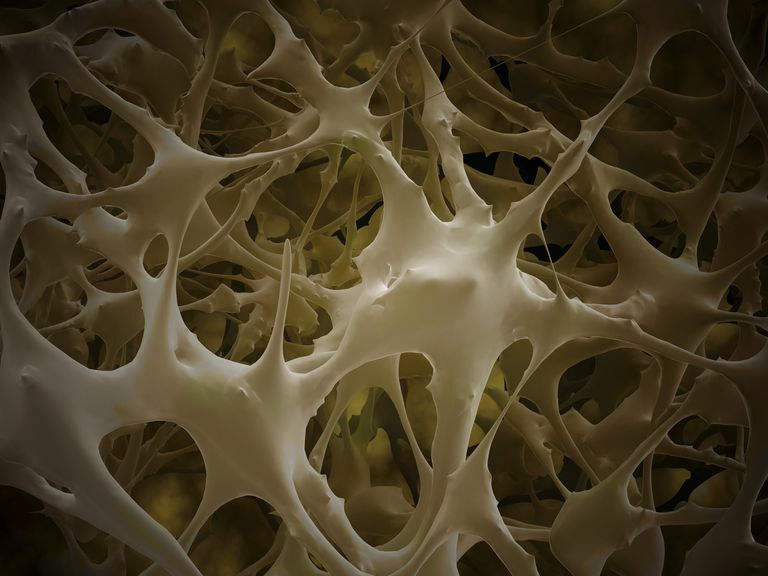 The process of new bone formation is called skeletogenesis. When this process occurs outside of where normal bone should exist, the result is called heterotopic ossification. The consequences can range from inconsequential to severe. In some cases, heterotopic bone will only be noticed because an x-ray was done for an unrelated concern. In others, the results can limit an individual's ability to perform even simple activities, such as walking. Treatment of heterotopic ossification is difficult, as little is understood about what triggers this condition to occur. Because there is little understanding of why heterotopic bone may form, it's difficult to know how to prevent additional bone from forming. Surgical removal of heterotopic bone is possible in patients whose heterotopic bone is the result of surgery or trauma (brain and spinal cord injury patients). Generally, the recommendation is that their heterotopic bone should fully mature, meaning that no additional bone is forming. At that point, surgery may be considered to remove the bone. This is usually performed to allow movement of a joint that had frozen as a result of the bone formation. In patients who have a genetic disorder that has caused the heterotopic bone to form, surgery is the wrong treatment. In fact, in these patients, performing surgery to remove the abnormal bone may worsen the overall condition. Research is being done to determine if there are genetic treatments to alter the expression of genes seen in patients who have heterotopic ossification. These treatments are in the earliest stages of investigation. In patients at high risk for the development of heterotopic bone formation, there are several treatments that have been used to prevent the development of excess bone. Certain medications, including high doses of nonsteroidal anti-inflammatory medications (NSAIDs), have been shown to decrease the development of heterotopic bone. Another controversial treatment is the use of radiation treatment in a single dose to alter the cells that produce the excess bone formation. Radiation is sometimes used after major joint surgery or in patients who have a history of the development of heterotopic bone. Radiation treatment is controversial, as radiation can cause tissue damage and delayed healing where surgery has been performed. In the past, some surgeons were using radiation at the time of hip replacement surgery to ensure heterotopic bone did not form as a complication of surgery. Currently, unless the patient is considered at high risk for the development of heterotopic bone formation, radiation treatment is not recommended. Kaplan FS, et al. "Heterotropic Ossification" J Am Acad Orthop Surg March/April 2004; 12:116-125. Healy WL and Iorio R. "Heterotopic Ossification After Hip and Knee Arthroplasty: Risk Factors, Prevention, and Treatment" J Am Acad Orthop Surg November/December 2002; 10:409-416.